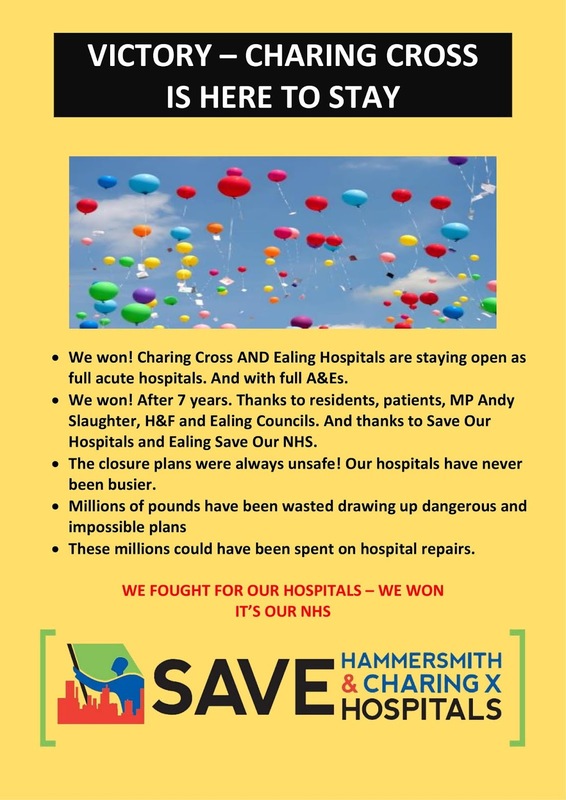 Today in parliament (26/03/2019) the Secretary of Health Matt Hancock announced that the closure plans for both Charing Cross and Ealing hospitals contained in the cuts & closures plan known as Shaping A Healthier Future have been withdrawn We've won. 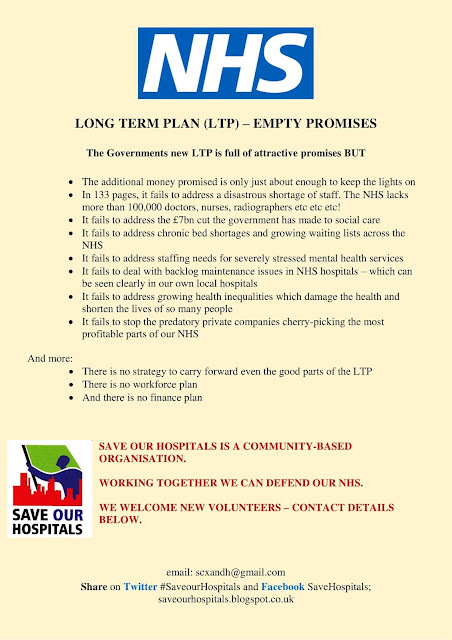 Its not been easy taking on a well funded posse of spin doctors, management consultants and political ideologues but many thousands of people have done just that and after a 7 year fight we've stopped a closure plan that was downright dangerous. Everyone has done their bit whether that's signing petitions, challenging bureaucrats in meetings, running street stalls , demonstrating, fundraising or delivering & displaying posters. Tonight we should feel really proud of ourselves and celebrate our collective achievement. 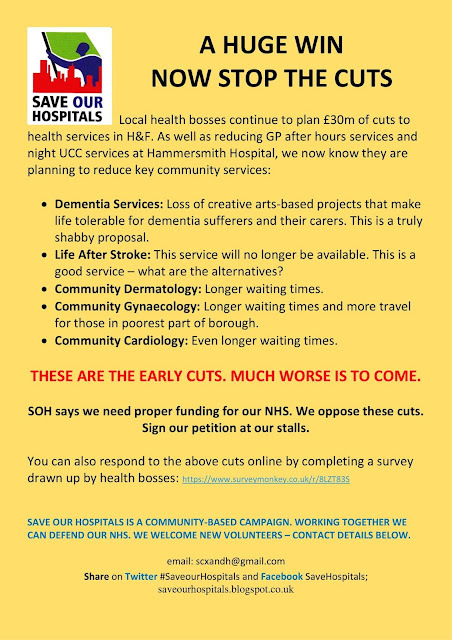 Of course there are still huge problems: The £30m primary & community cuts planned for H&F, the state of disrepair in our hospitals, on going understaffing & under resourcing coupled with the threat of privatisation by the likes of Babylon and Virgin. Some may have seen the laughable attempts of local conservative MPs and councillors to claim responsibility for a victory they have consistently done their best to sabotage It's also true that the government could change it's mind and come back with new closure plans in the future. So we'll have to keep campaigning - we've proven today that campaigning works. But for tonight let's just celebrate a victory won by lots of different people (including you) working together to Save Charing Cross Hospital. 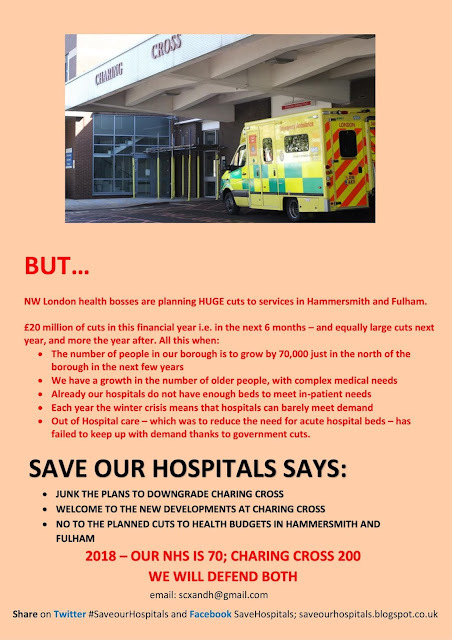 There are plans to close an "underused" out of hours urgent care centre in Hammersmith . It's where you can go 24-hours-a-day to be seen urgently if your illness is not life threatening. And, if you have strong views on that, now is the time to speak up. Residents are to be asked what they think - there are six weeks to have a say. 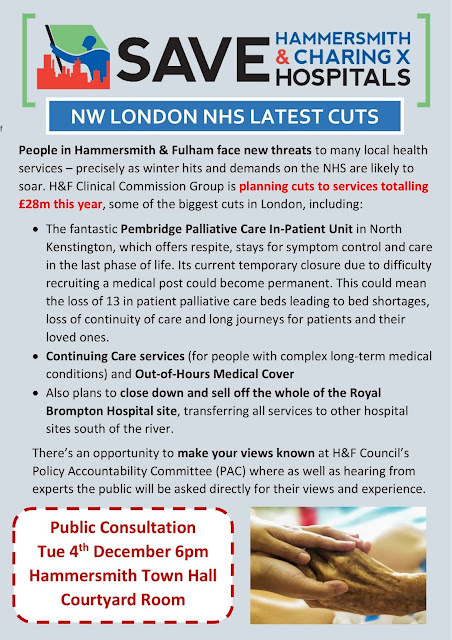 The closure is one of several options which will be included in a consultation this month as the cash- strapped Hammersmith and Fulham Clinical Commissioning Group looks to save money. It estimates that shutting one of its two urgent care centres which are open overnight from 8pm to 8am, reducing weekend plus GP appointments from one practice to three and cutting 155 extended hours GP appointments a week, could save £1m a year. 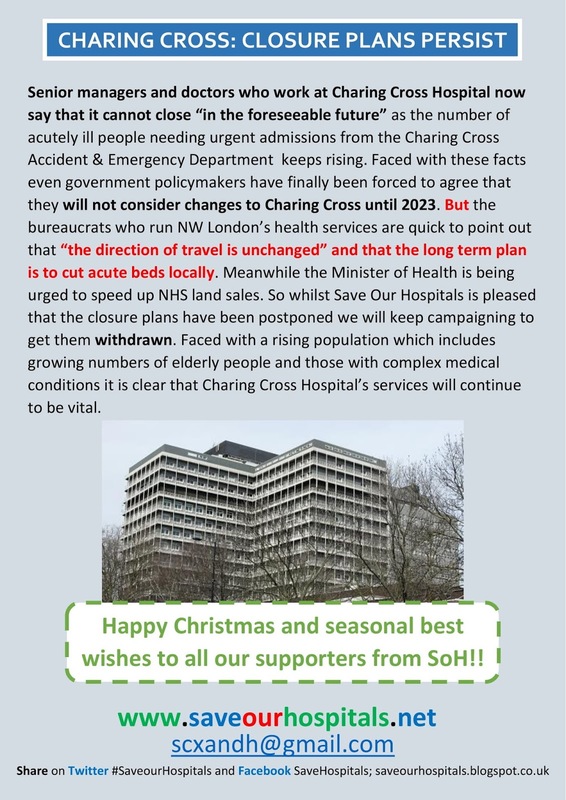 It said it had no plans to close the urgent care centre at Charing Cross Hospital, or reduce its hours from 2am to 6am. So, how under-used is it? 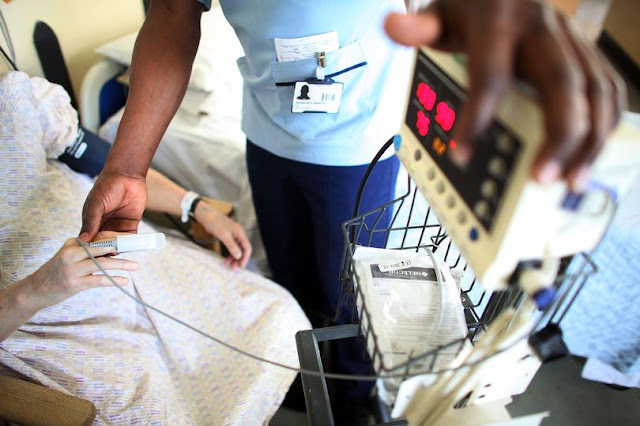 An average of seven patients are seen at the urgent care centre at Hammersmith Hospital on any night. Of those, an average of only two need emergency or urgent care, according to the CCG. It said the highest number of people ever turning up between midnight and 8am was 18. So it's up and down. But that's still a lot of people. 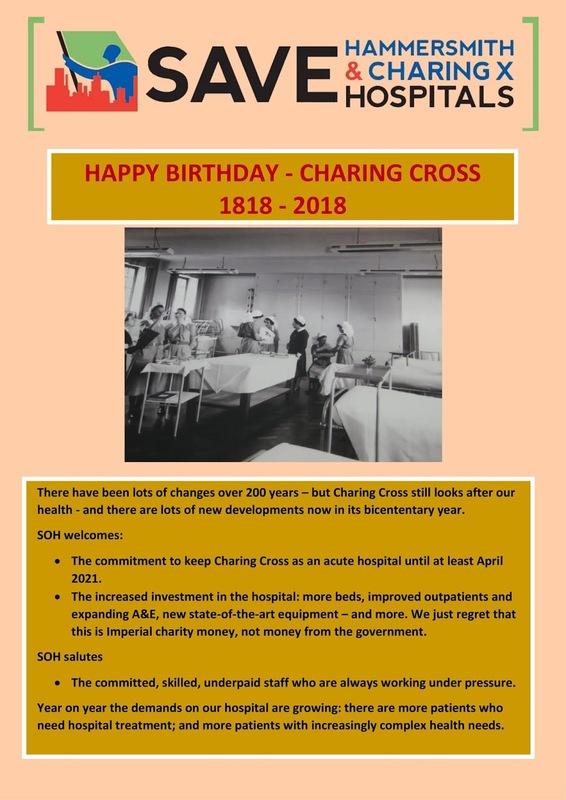 In 2017/18, nearly 33,000 people visited, with 47,000 patients turning up at Charing Cross, which has seen a maximum of 20 people during the midnight to 8am slot. The CCG has already talked to Healthwatch about the best way to consult residents about the options. MD Janet Cree told Hammersmith and Fulham’s health and well-being board that it was not practical to send letters to every patient. That data is not available. It has already staged a series of pre-consultation events and discussed ways it will stage the formal consultation. 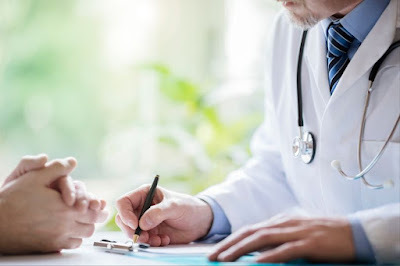 The CCG’s co-vice chair, Vanessa Andreae, said patients commented at last year’s pre-consultation events that "they were not always aware of what’s available. Having a single location could reduce that complexity". She added many of the appointments were filled by the practices’ patients. Ms Cree said: "There is nothing determined until we get that feedback." Councillor Ben Coleman, who is Cabinet member for health and adult social care urged residents to respond. The Labour politician said:"Our local NHS is under attack from government funding cuts. 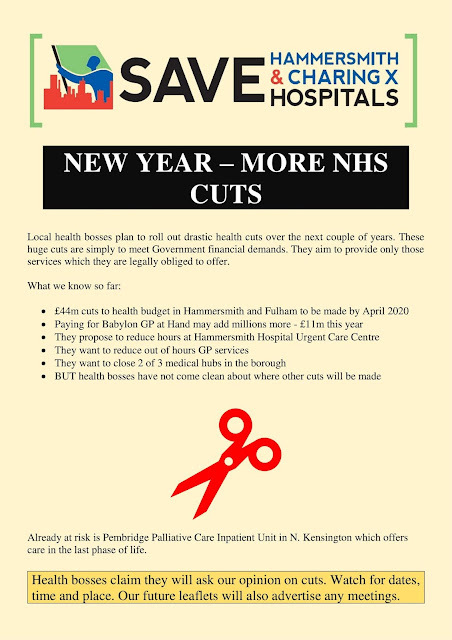 Almost 50 people attend Hammersmith Hospital's Urgent Care Centre overnight each week and nearly one in three of these requires urgent or emergency treatment. "This consultation could lead to the service being closed. I urge residents to respond." The consultation will last six weeks. One of management groups that buys in health care for people across huge areas of West London is going to have to make savings of some £44 million, but won't yet tell people what services are to be cut. 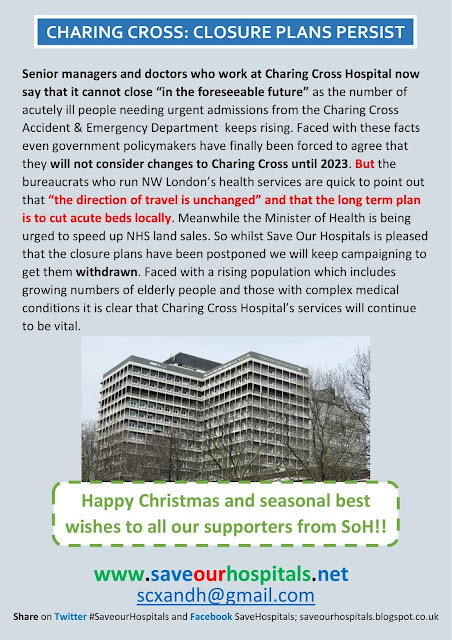 Help us SAVE Charing Cross Hospital from DEMOLITION! Save Our Hospitals. Picture Window theme. Powered by Blogger.